Remember that somewhat confusing equation that left Microsoft with 5x more Android dough than Windows Phone profits? We already detailed the situation, but for those of you who missed it, Microsoft holds patents on certain facets of Android technology. Because of that, every Android-based smartphone sold by HTC rakes in a $5 licensing fee for Microsoft, an agreement the companies reached out of court. We thought that Microsoft would have already covered its Android bases and reached more secretive agreements with heavy-hitters like LG and Samsung, but Reuters reports that the cash-grabbing has only just begun, and this time Samsung is in the cross hairs. 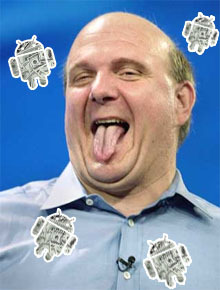 What’s more, Microsoft has upped the ante, asking for $15 for every Samsung-built Android device sold. That’s quite a price hike from the deal Microsoft has in place with HTC, but I guess it’s only smart to aim high and negotiate later. Samsung will likely enter into a stronger alliance with Microsoft and its Windows Phone 7 platform in order to lower that licensing fee to about $10 per phone, according to unnamed industry officials. According to the math, Microsoft has made around $150,000,000 from HTC-built Android phones, compared to the roughly $30 million received from Windows Phone licensing. There’s absolutely no reason why Microsoft wouldn’t want to do the same with Samsung, who is poised to become the world’s largest phone maker in the upcoming quarter. The only question now is, who’s next? Watch your back, LG.